This is the story of three South Africans and their brush with fate. Marketing graduate, Mpho had just landed a great sales job at a top furniture store when, as luck would have it, they retrenched all new staff. Shy IT geek, Sam was unfortunate enough to be the ‘wrong colour’ and couldn’t get a tech job. Successful engineer, Sandi had been promoted to management, but Sandi had an idea for an innovative medical device so he left to start his own business. Mpho and Sam met at a Startup Weekend. Sandi was there too. Mpho and Sam came up with a great product but neither would be able to make a success of it on their own. Fortunately, they could see that they had a greater chance of success if they combined their strengths. Naturally, they formed MaShup. Sandi was afraid that a partner might steal his concept. The MaShup team drew up a basic business model and shared out the work according to their strengths. Sam produced a website that search engines would find. Mpho had been building a contacts list since college and started calling them. Sam approached the bank for finance but they weren’t ready to take a risk on a start-up. Mpho tried to interest a large tech corporate but unfortunately they were already developing a competitive product. Money was running out and no-one was interested in the product. Mpho got a puncture from a pothole the day after Sam’s computer crashed. Things were getting depressing until Mpho read Herman Mashaba’s life story in Moky Makura’s South Africa’s Greatest Entrepreneurs. Sandi went home and started refining his idea. He asked his friends and former colleagues to tell people about his invention. They were impressed and were sure that it would be a great success. He patented it. No-one contacted him to ask about his idea. He wondered how MaShup were lucky enough to get into an incubator, and to get seed capital with a product that was inferior to his. When he explained it to a previous client and she did not get excited about the idea, he reasoned: Aw well, that’s just bad luck! There’s nothing that you can do about it. It wasn’t sour grapes, he knew it was just the luck of the draw, but he did envy the way Mpho and Sam always had these happy accidents. Lucky people can also get side-swiped in a traffic intersection or they may drop their phone in the toilet. It’s how they respond to misfortune that matters. They don’t bemoan their bad luck. Sometimes it even presents them with an opportunity. So, what can you do to get Lady Luck to look kindly on you? Mostly, bad luck is related to pessimism, it’s a mind-set, a bad habit. Sometimes, it’s circumstances beyond your control, like a traumatic event or depression. You may be afraid of disappointment if you are unsuccessful. Then, when you fail, you can say: it’s what I expected. When things go wrong, do you say: That’s Murphy’s Law, things will go wrong? Maybe you are a realist, a pragmatist, it’s smart to take out insurance in case something happens, because things do happen. And when they do, you can say: I told you so. Being distracted by the possibility of bad fortune can prevent you from being ready for good fortune. The takeout: they would just have to make their own luck.Sam made a working prototype. Mpho took a taxi to a trade show and demo’ed it to the exhibitors. Sam used the computer at the municipal library to write articles about innovation and spread them to journalists through social media. At night, they read everything they could about how to make a micro business a success, about working smarter, not just harder. Mpho enrolled in a free business start-up course and co-incidentally met a mentor with ideal contacts. Sam got MaShup into an angel investor sponsored incubator and serendipitously met someone who was looking to fund a product with potential and a business with guts – just like theirs. Mpho and Sam discovered early on that you can increase your propensity for ‘good luck’ by how you approach situations. But can you make yourself lucky? Psychologist Richard Wiseman says there are four reasons why some people are ‘luckier’ than others. ‘Lucky’ people deliberately maximise chance opportunities, they trust their intuition, they expect good fortune, and they consciously turn bad luck into good. He says that lucky people actively create, notice and act on chance opportunities by being open to new experiences. Because they expect to be lucky, they are lucky, and the luckier they are, the better they get at being lucky. A sort of self-fulfilling prophesy. But you have to be consciously ready, prepared for it, almost expecting it. Oprah Winfrey said: I believe luck is preparation meeting opportunity. I think that Louis Pasteur, who ‘stumbled upon’ penicillin, put it better: …chance favours only the prepared mind. ‘Lucky’ people make a conscious decision to be confident. They develop a positive, optimistic outlook. They are open to new things, to opportunities, they expect good things to happen, they expect to succeed. If you’re shy (like me), join organisations, go to their events. Force yourself to talk to strangers, find out what they do, get their business cards. Networking like this will put you in touch with future business opportunities. It takes guts to do the unfamiliar, to get out of your comfort zone, to take calculated risks. You can’t succeed if you don’t try, and sometimes you will fail. Successful people get up again, they find out the cause of their failures. Really, it’s how you respond to misfortune that makes you lucky. People who have suffered trauma or are prone to depression get professional help. So you can learn to be lucky. Don’t wait for luck to happen. It’s your decision: be in control, make luck happen for you. Be alert for when opportunity knocks. Luck rarely just comes to you. You have to work at it. Internationally-famous South African golfing legend Gary Player famously said: The harder I practice, the luckier I get. In the game of life, You gotta try your luck – if you don’t play, you can’t win. So, is it just ‘luck’ that you decided to read this? Or are you predisposed to making yourself ‘lucky’? In this article, Mpho, Sam, Sandi and MaShup are all fictitious. Click here if you want to discuss the role attitude plays in business. 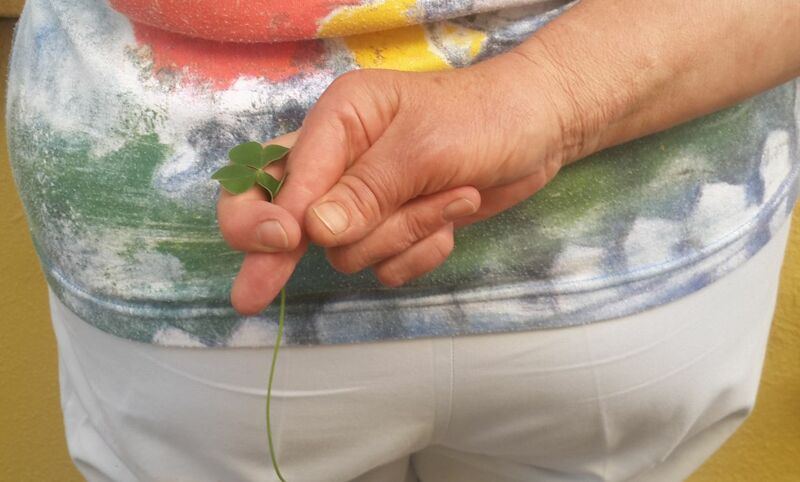 Can an entrepreneur really make his or her own luck?